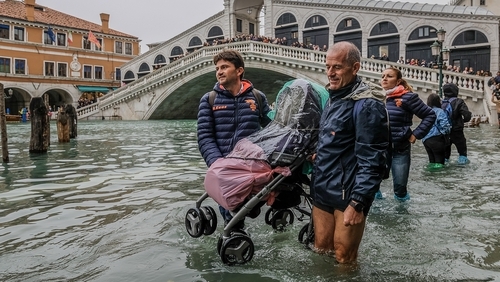 Rain-soaked tourists were barred from St Mark's Square in Venice where local authorities said the "acqua alta" (high water) peaked at 156cm, leaving almost three-quarters of the Italian city under water. Elevated wooden platforms usually placed on main passageways in the Renaissance city were not high enough to ensure safe passage in the low-lying square. Families carried children on their shoulders through the surrounding streets. While some tourists donned wellies, others had opted to take off their shoes and wade through the water. The waters have only topped 150cm five times before in recorded history. In 1966, when floods swept through the country, famously devastating Florence's historic centre, the waters reached 194cm in Venice. Nearly all of northern Italy was on alert due to storms, which swept across the country yesterday, with wind gusts up to 100km/h and rainfall in some places equivalent to the amount that falls over several months. At least eight people were killed and the national Civil Protection Agency issued multiple weather warnings, with many local authorities shutting schools and urging people not to travel unless absolutely necessary. Two young people died south of Rome when a tree hit the car they were travelling in, while another person was killed and several injured in the nearby town of Terracina after winds brought down scores of trees. Dozens of trees were reported uprooted across Rome and many parks and tourist sites were closed, including the Roman Forum and Colosseum. With further bad weather forecast, dozens of towns and cities said they would keep their schools closed, including in Rome, Venice, Verona and Naples.